D12 x H8 / D31cm x H21cm (Diameter x Height). Genuine 30% Full Lead Premier Crystal. UL and CUL listed for safety. You can return the lighting fixture within 14 days as long as its in the original condition and packaging. 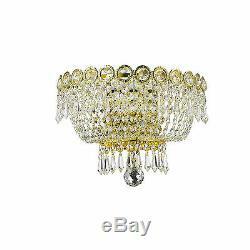 Our crystal chandeliers can be seen at. Prestigious hotels, restaurants, casinos, and churches. Our Crystal Line is nothing but genuine crystals. We DO NOT carry imitation or plastic. Our crystals are 30% Full Lead PBO crystals for finest clarity and brilliance. Please be aware there are a lot of genuine crystal chandeliers out there that have lower percentage, which makes the crystals dull and less sparkling. Due to certain circumstances there may be times where delays occur. Transit time varies during peak periods. The customer is responsible for returning the product in its original condition including all the accessories, packing and the box. Items showing used, abused, or worn cannot be accepted for return credit. We cannot take back any fixture which was assembled or installed prior to return. The item "2-Light Gold Finish D 12 x H 8 Empire Crystal Wall Sconce Light Traditional" is in sale since Thursday, June 23, 2016. This item is in the category "Home & Garden\Lamps, Lighting & Ceiling Fans\Wall Fixtures". 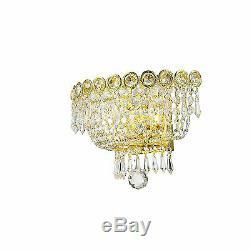 The seller is "topcrystallighting" and is located in Ontario, California. This item can be shipped to United States, Canada, United Kingdom, Denmark, Romania, Slovakia, Bulgaria, Czech republic, Finland, Hungary, Latvia, Lithuania, Malta, Estonia, Australia, Greece, Portugal, Cyprus, Slovenia, Japan, China, Sweden, South Korea, Indonesia, Taiwan, South africa, Thailand, Belgium, France, Hong Kong, Ireland, Netherlands, Poland, Spain, Italy, Germany, Austria, Israel, Mexico, New Zealand, Philippines, Singapore, Switzerland, Norway, Saudi arabia, Ukraine, United arab emirates, Qatar, Kuwait, Bahrain, Croatia, Malaysia, Brazil, Chile, Colombia, Costa rica, Dominican republic, Panama, Trinidad and tobago, Guatemala, Honduras, Jamaica, Bahamas, Viet nam, Uruguay, Antigua and barbuda, Aruba, Belize, Saint kitts and nevis, Barbados, Bermuda, Brunei darussalam, Bolivia, Ecuador, Egypt, Iceland, Nicaragua, Oman, Peru, Paraguay.